We have recently taken part in a conference organised by Richard Lefebvre (EMEA CRM & HCM Partners Program Director), where Chris Hamilton (Product Manager at Oracle) discussed the Oracle RightNow roadmap for 2014/2015 and some ideas on the general direction that Oracle intends for RightNow. For background reference, Chris had worked for RightNow for 9 years prior to the Oracle acquisition, and with Siebel for 5 years before that. We’ve been blogging about RightNow cloud service and Oracle Service Cloud and you can read our previous blog posts here. Oracle continue to reassure partners and customers of their commitment to the RightNow product line by pointing out that the size of the RightNow development team (500 people) has doubled since acquisition. Continuing on an unbroken 5+ year quarterly release plan, RightNow cloud service is now on track for its February 2014 release. This and subsequent releases will be packed with features and improvements. It is interesting to point out that Oracle last year spent quite a bit of time on mobile. With a reported ratio of one in seven customer interactions coming through a mobile device, it makes perfect sense to support those channels. As part of that, Oracle have not only rolled out apps for the usual mobile platforms in the past few years, but they have also started to add support for "simple browsers" in many areas. Look out for a future blog post on the RightNow mobile app in the near future. In line with the general objective of increasing support staff efficiency and reducing the cost of a customer support organisation, significant improvements to chat, proactive chat, co-browse and the Virtual Assistant feature are expected in the near future. Virtual Assistant was released just last year, on the November 2013 release. Using the natural language processing capabilities brought on board with the acquisition of Q-go by RightNow in early 2011, the Virtual Assistant helps users by responding to queries formulated in natural sentences. It will be integrated with live chat, for those cases when Virtual Assistant cannot solve some situations: for example, customers will be able to explicitly request a live agent or, using natural language processing, the Virtual Assistant will also be able to tell when customers are getting frustrated and then automatically switch to a live agent. One thing to keep in mind is the list of languages and industries supported. General availability of Virtual Assistant is expected later this year. Another investment in self-service is the use of community-driven solutions and content. Starting with the acquisition of HiveLive by RightNow back in 2009, community forums have since been a channel for self-service and Oracle have continued to support this in Oracle Service Cloud, including now the ability to combine search results across community and Knowledge Base (KB) into a single result set. We’ve seen syndicated widgets used before, for instance for proactive chat (where “syndicated” refers to a widget that is controlled by RightNow, but displayed on any web site), and this will continue to be extended to include also the ability to put a social thread anywhere on a site. Given the recent trends of social customer engagement, such as the preference for a brand’s social media site for customer service interactions, the rising number of customer service requests on social media sites and the ever increasing expectations of those customers, it shouldn’t come as a surprise that the self-service channel for Facebook introduced last year will continue to see improvements. These will include the ability to access the PHP source code for full branding and customisation and the introduction of the Virtual Assistant also within Facebook. The ability to perform skill-based assignment is expected to be included on the May 2014 release. This will make routing the incoming requests to the best available agent considerably easier to set up, more efficient and overall more effective, by introducing a level of fine-grained control that was not available before, or that required considerable levels of customisation. Rules will be able to use the agent’s availability, skills (such as specific product knowledge) or language, along with prioritisation of VIP and other segments. Although these features are expected to be available initially only for chat interactions, skill-based routing is expected to be extended to the whole application later in 2014-2015. 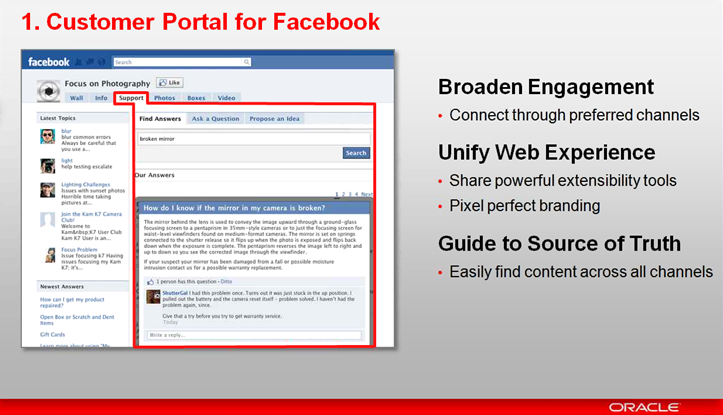 The investment in social customer engagement will continue to see improvements also on the agent-side of the interaction, where Oracle is expected to continue to leverage their 2012 acquisition of Collective Intellect, that brought cloud-based social intelligence solutions enabling organizations to monitor, understand and respond to consumers’ conversations on social media platforms such as Facebook and Twitter. Some of the expected improvements to social monitoring will bring new social profiling capabilities (scraping information off social sites, like picture, email address, etc., to be added to the contact profile). Following on what is a common custom extension to the RightNow data model, Oracle will be introducing asset registration through the agent desktop and customer portal. The ability to track assets is a common requirement associated to improvements in resolution time. Also new in the coming releases will be the ability to track SLAs associated to those assets, or more generally to a customer, and the corresponding entitlements. In line with other Oracle innovation trends, especially on Oracle Sales Cloud, there are a couple of now-familiar products coming to Oracle Service Cloud: Oracle Social Network and a simplified web-based UI. Oracle Social Network (OSN) is a seamlessly integrated tool to allow agents to collaborate on incident resolution. With OSN also available as a mobile app, this effectively allows anyone in the organisation to collaborate anytime, anywhere. 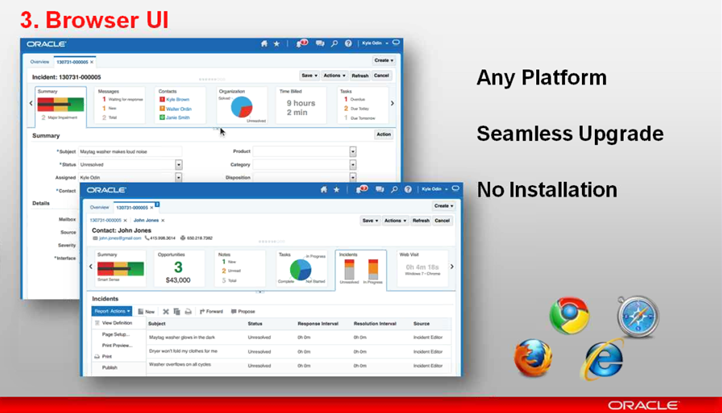 The new “simplified” web-based UI (Oracle Sales Cloud users will undoubtedly establish parallels to the Fuse user interface) is expected to be introduced in stages of increasing complexity: initially a very simple interface for mostly read-only tasks, it will grow in complexity to support most agent activities (expected only from 2015 onwards). Full administrator features are expected to remain on the smart client. This smart client (also known as Agent Desktop) has been around for 6-7 years and will also see major improvements this year: a more modern facelift, additional usability capabilities especially for multiple monitors, and significant improvements to the performance of complex desktop rules. Because the agent desktop effectively runs on the agent’s local machine, it is expected to remain the UI of choice also for those exceptional cases in which custom add-ons are required for integration with applications running behind corporate firewalls. Work is also being undertaken to integrate Oracle Service Cloud with other more mature Oracle products, such as Oracle Business Intelligence (OBI), in this case for customer service data to co-exist with data from other applications. Using the capabilities of OBI for reporting will not only allow data from multiple sources to be consolidated, but also to report beyond the currently available operational data and to perform complex analyses on a massive scale only available on a full-fledged analytics tool. It is worth mentioning that bridging analytics across cloud and on-premise is a key strategy for Oracle, as we saw on the OBI roadmap earlier this year at Oracle OpenWorld. 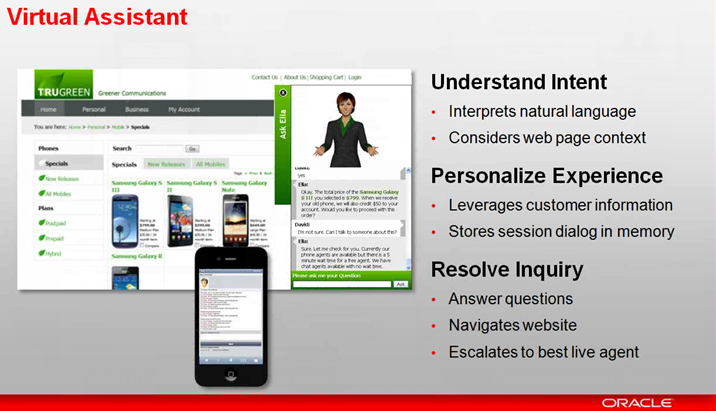 Some incremental improvements on RightNow’s knowledge management area are being introduced (such as the use of the auto-tuner to improve the Smart Assistant’s hit rate upwards of 30%, thereby reducing the load on customer service representatives), but the major disruption will come from another Oracle acquisition whose integration with Oracle products is expected soon: InQuira (acquired in 2011). In fact, a new whole rebranding of InQuira and related products into Oracle Knowledge will bring some changes in that area. Although currently an on-premise solution, Oracle Advanced Knowledge (InQuira) is being moved to be provided also as a cloud service and will be used as an option to RightNow’s knowledge management capabilities (to be re-branded Knowledge Foundation). Both options will exist under the Oracle Knowledge umbrella, and the choice between the two will depend on specific customer requirements. 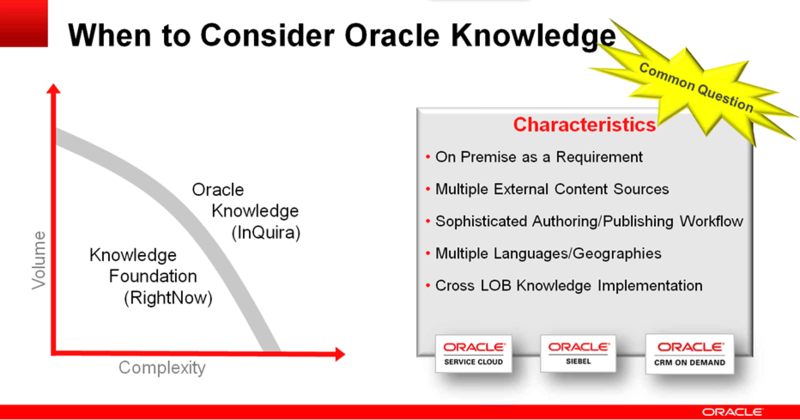 Some of the benefits coming with Oracle Advanced Knowledge are: the ability to bring content from multiple external sources, advanced natural language processing capabilities and intent-based tuning, advanced content authoring using publishing and approval workflows and versioning. An important area where Oracle have explicitly pledged to continue developing is in integrating all their Cloud applications. Further integration capabilities are expected not only between cloud applications, but also with on-premise applications, such as Siebel. If you would like to know more, you can read about our Oracle Service Cloud (aka RightNow) consulting services here. Alternatively you can call us on +44 203 283 4315 or contact us here. Luis has 14 years’ experience as a CRM consultant, across a wide range of industries and geographies. Past clients include government agencies, banking and public sector institutions in Europe and the Middle East, as well as telecommunications companies across Europe, the Middle East and Africa. Boxfusion's Cloud Lead, Luis holds a number of certifications on Oracle products, including Oracle Service Cloud (RightNow CX), and leads Boxfusion's delivery efforts on CX Cloud projects.